In the final days before welcoming T home last summer, I opened my 151 g of Ramie top, and started spinning on my painted East European saxony wheel. This is my first project with Ramie & was love at first spin. Priorities soon made themselves known. The night that I had given a Lecture on not touching Mom’s tools, I took this wheel and its Ramie up to my studio. The fibre stayed downstairs but it was a pretty vain hope. With everyone under strain family bonding was clearly more important. What I didn’t know then was how long that takes when your child is aged 4, and circumstances are what they are. Sitting at wheels took a back burner as we navigated our long, early parenting days. Others came out but this easiest-to-knock-down wheel was up until just last month. Dust-gathering no more! Ramie stash spinning again. Small note – It is a crazy peg array. Safety first, and I am not telling anyone to follow this particular flight of fancy. Should I buy this? A: maybe – do you know what you are looking at; do you like to spin fine? Did I make a mistake in buying this? A: it depends; I love mine. Invariably, 1 or more voices on the thread cry down that these small wheels make you “treadle like a hamster even if it operates.” Well, mine operates and that is not my experience. At all. 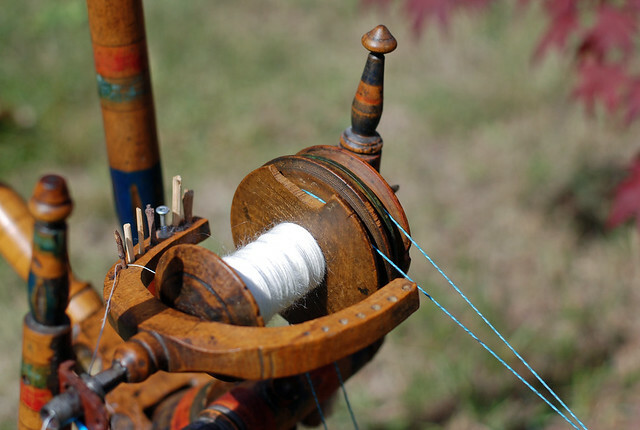 The wheel has such a gentle action in terms of the draw-in of the yarn, and the old leather hinges on the treadle bar. It is also an almost wheel-less feeling as I work since she stands below my torso. With the band fitted and at the right angle with the mother-of-all, this is smooth and easy spinning now that my (yes, crazy; do not do) pegs are worn in a bit. Sometimes, I do need to fiddle with the mother-of-all screw tension. Most times it is fine with my Hempathy yarn band going strong. When running these wheels have a sweet spot of momentum. We are at around the half-way mark to what experts call the family equilibrium. Supports have come and gone; other supports are tremendous. Not only is this & my Martha wheel now carrying spins-in-progress but I got myself an afternoon away this weekend as a real break. This top-down to toe-up piece is a March pattern release by Sarah Jordan called Kissing Cousins Socks. It is in a Turtle Purl yarn, Tiberius. The Cheviot wool dyed by Sheepy Time Knits is my ‘Pyrenees Delight’ Tour de Fleece project. 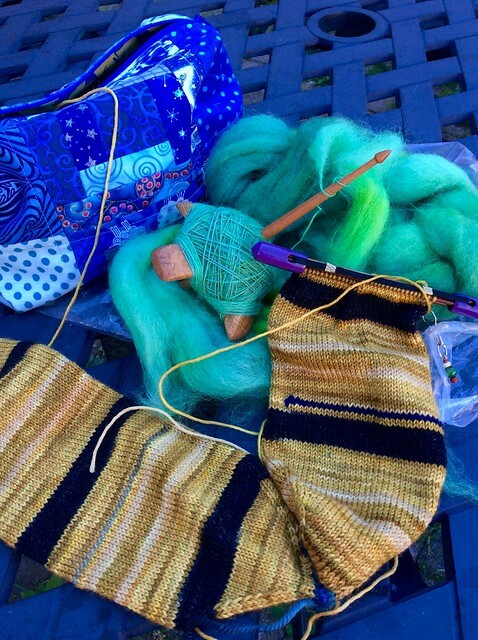 It was such a thrill to have my spinning picture featured by Ravelry and this has stayed in my spinning rotation ever since. Progress and respite. I wish the same for you! 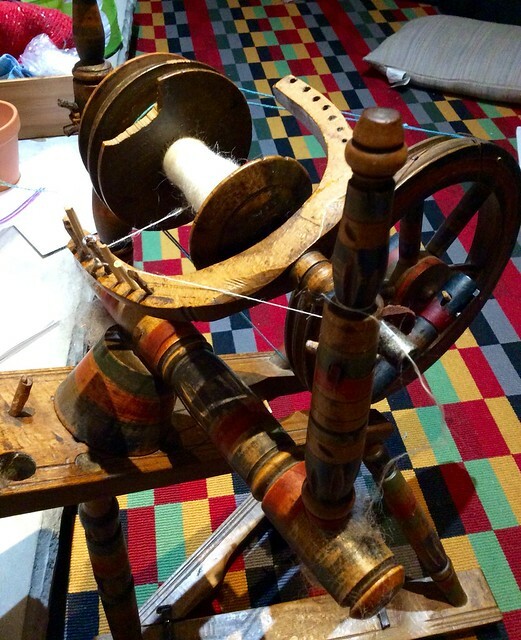 Categories: Getting the knack, Spinning | Tags: Antique spinning wheel, Cheviot wool, Equipment, Ramie, saxony spinning wheel, Sock, Spinning | Permalink. Not Child’s Play, it’s a Flax Wheel! 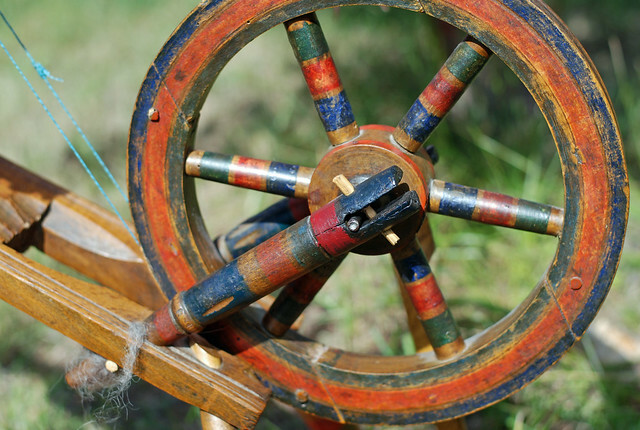 A few weeks ago, I stumbled across a Kijiji ad: Antique Child’s Spinning Wheel. Just 2 pics but it looked doable in terms of price, and location. After lots of searching, I decided that it is a flax saxony spinning wheel, probably brought here by an Eastern European family. The Antique Spinning Wheels Ravelry group also helped calm my fears that she was going to turn out to be a sad little Frankenwheel. Naturally, I was doing this all in secret. DH’s first reaction? He may have asked, “Where will you put it?” but he soon rallied. Even Melvin fits! The hinges are leather, and the treadle is practically made for my size 7 foot. I worked on the wheel that first weekend, and gave her a Murphy’s Soap bath followed by plenty of tung oil, a new front leather, and pegs for everywhere. The spa treatment went fairly quickly but I sought help on Ravelry to get her fully functional. See the massive chip in the bobbin? It unscrewed easily but the flyer shaft was very rusty. WD-40 scoured and left overnight did help… a bit. This flyer probably never had hooks or nails but the spinner would move an eyelet peg along the holes. The back holes show much more wear. The ‘Proof of Spin’ pic also shows my fix for the pegs. Like the steam punk? Reed Needles aka Wheelwright on Rav does too! Woodworms made their mark in the mother-of-all housing. I worried it would need shoring up but all has been well through spinning 1.5 bobbins of BFL wool. The important thing is that the screw tension is totally undamaged and moves well. Is it rude to look under a slanty’s skirts? Don’t carve leather with a buck knife and expect to come away unscathed. It took some shaving but now the flyer moves freely. I kept the old leather… it was very badly worn wide. The drive wheel crank is one of my favourite things about this wheel. Small but perfectly formed. Maybe the nail got hammered in after the top of the distaff went missing? Melvin has been positively doting about the wheel. It’s not just that he wants to get in on the action. I named the wheel Chella because it reminds me so much of my Grandmother’s older sister who never married but loved crafts. It took a few tries to get the right drive band – the purple Hempathy. I absolutely love this wheel. She’s a good spinner, and the low profile is ace for tv watching. The paint on all sides is adorable & I am dying to try to spin line flax with her. Categories: Good Gnus, Spinning | Tags: antique, BFL wool, Equipment, Ravelry, saxony spinning wheel, Spinning | Permalink.